You may be ready to start creating that game-changing app, but your computer probably isn't. Before we can start coding, we must first install a few things for your machine. Yes, I know. It's a hassle. But once you spend the next few minutes getting your computer ready, you will be fully prepared to create your first Android app. Hang in there! Note: If you have already followed Unit 4 - Day 2 of our Game Development Series (or have already installed the Android SDK with Eclipse), you can skip to the next lesson! We need the following tools setup on your development machine. I. Installing the Java Development Kit (Skip to Step II if you have Eclipse installed and running). Android is based in Java. Android requires that you use the Java 1.6 compiler (described in detail further). Java 7 is backward-compatible with Java 6 (1.6) so if you have that, you should be fine -- provided that you follow the next steps. Note to Mac users: Most likely, Java is pre-installed on your computer. Skip the installation step. Click the "Download" button below JDK 7. 2. 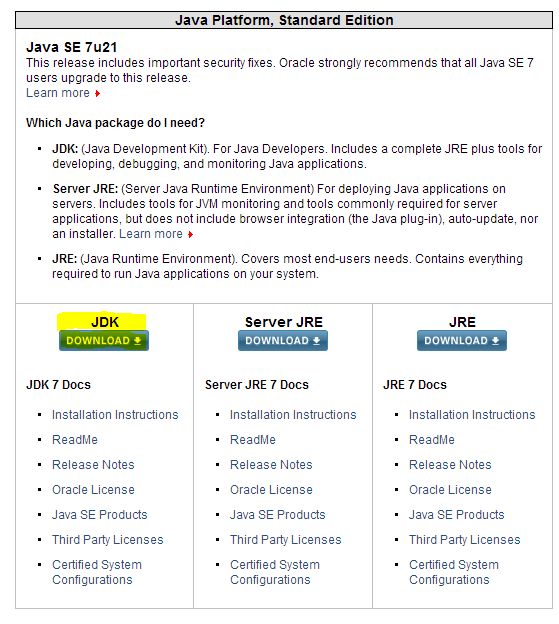 Once you are there, look for YOUR operating system and version and download the corresponding JDK. On Windows, you can check this information by right clicking on My Computer (or Computer), properties, and you should see your type next to System type. Note: Windows x86 refers to 32-bit, while Windows x64 refers to 64-bit. Once you have installed the downloaded file, we will be done with Step 1. 1. Java Development Kit (Done). 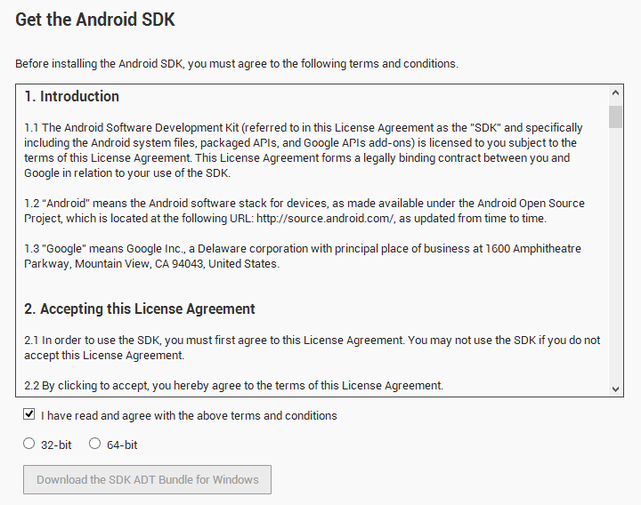 Once you press "Download the SDK ADT Bundle" it will begin to download the 399 MB file. As we saw in Day 2, Eclipse is your central development tool. Here you will be writing your code, adding resources, debugging your apps, and exporting them when finished. 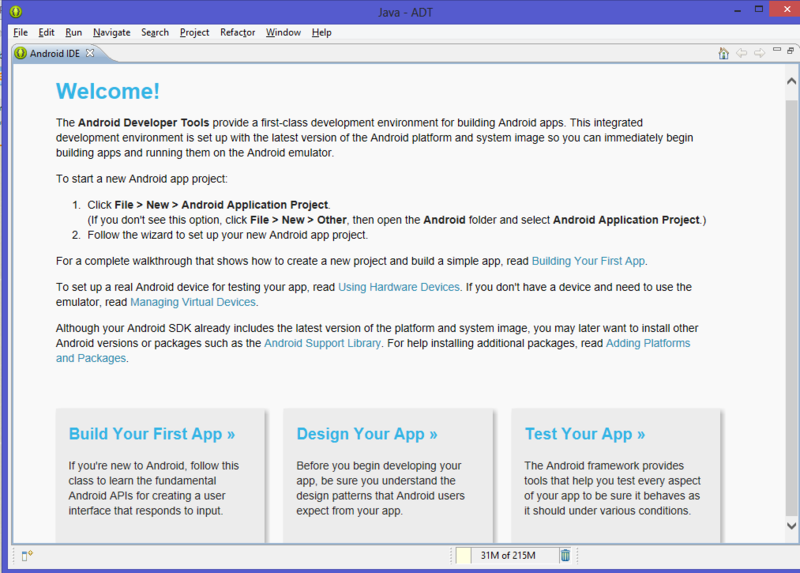 The Android SDK (software development kit) contains various tools and programs you need to develop on Android. It lets you download full Android versions (like Jelly Bean) that you can create an Emulator (or Virtual Device) with, and also contains various libraries that you can import from as you build on Android. 1. Open up the directory you extracted the Bundle to, and go to the eclipse folder, and run eclipse.exe (perhaps create a shortcut on the Desktop/taskbar/dock). 2. Select a workplace of your choice (this is where all of your source code is saved). 3. By now, you should be able to see this welcome screen. That wasn't so bad, was it? Now it's your turn to start coding.